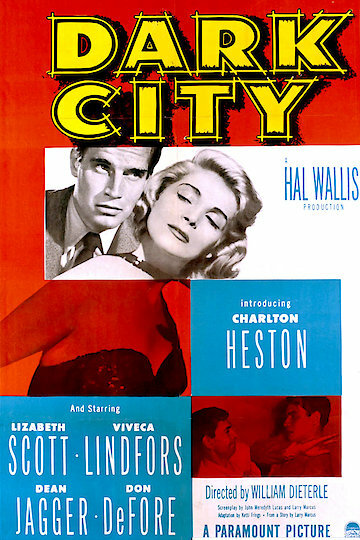 Dark City is a 1950 classic noir suspense thriller. It's a black and white film notable for being Charlton Heston's first starring role. Heston plays Danny Haley, a gambling hustler who runs an underground gambling joint that is routinely busted by the police. Through his girlfriend Fran, Danny meets a military veteran named Arthur and persuades him to join Danny in one of hie high-stakes poker games. The group of poker players manages to scam one mark at the table for $5000, however, next morning when people with ties to the game start dying, it appears that someone is out for revenge. Dark City is currently available to watch and stream, buy on demand at Amazon, Vudu, Google Play, iTunes, YouTube VOD online.